Warm Greetings Fellow JCI Family! In line with its 58 years of success, we will have a TOYM – TOFIL 2017 Visayas Media Huddle ( A Kapihan Session l #BisayaNaPud) at Sinulog Ballroom 1 Cebu City Sports Club Cebu Business Park on May 22, 2017 at 2:00PM – 4:00 PM together with JCI Philippines National Board and our partners: The TOYM Foundation, PLDT and Gerry Roxas Foundation. 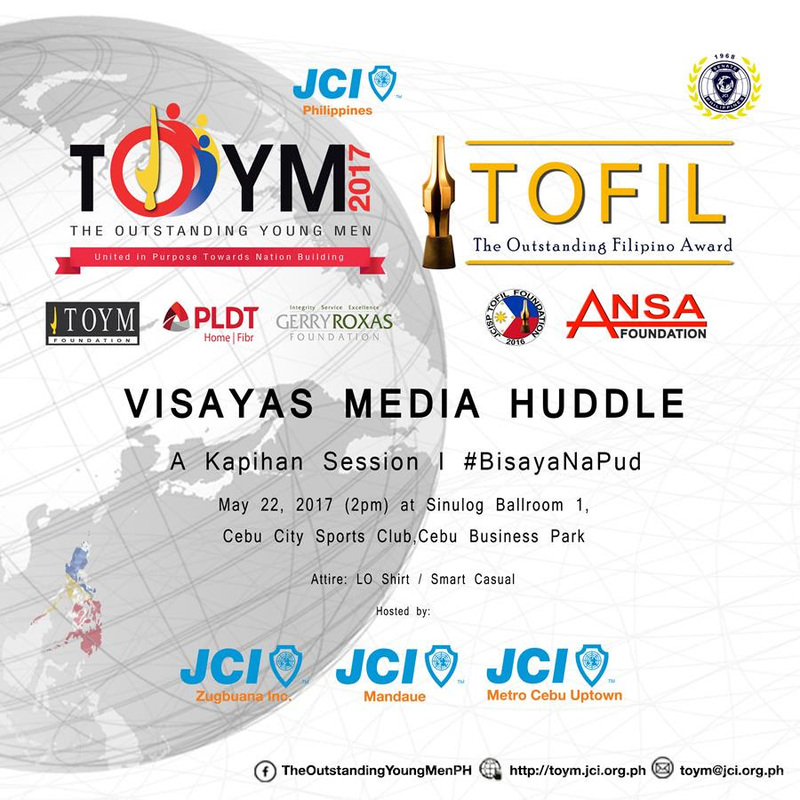 Attached hereto is the TOYM – TOFIL 2017 Visayas Media Huddle ( A Kapihan Session l #BisayaNaPud) invite. Following will be Area and Regional Pocket Launches in the coming weeks. For further information, please contact our Area 4 Chairman May Joan Abellana at (+63) 917-703-2885 and Cindy Tesoro at (+63) -917-791-2210 of JCI Zugbuana.